Welcome to La Lagune, a prime beachfront property surrounded by a postcard-perfect garden peppered with palms. Stylish and contemporary, with sun-drenched outdoor spaces, ocean views and refreshing sea breezes, La Lagune is a place where vacationers enjoy the best of tropical living. 10 guests are comfortably accommodated across in five bedrooms. Designed in a similar vein to the main living area, each of the rooms are outfitted with modern design elements, and feel airy and inviting. Amenities include a plush bed, quality linen, built-in wardrobe, TV, air conditioners and en suite bathroom. A sparkling 15 metres turquoise pool is located just steps away from the beach. Whether you cool off with a dip, or go for a stroll along the coast, you’ll be able to rinse it off conveniently at the alfresco shower. 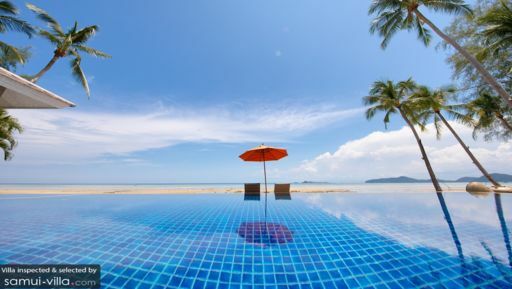 Loungers and day beds frame the pool, providing a comfy, sun-drenched spot to dry off and soak up the breezy Samui vibes. Clear blue skies, a lush garden that stretches out all around the property and towering palms - there’s no better place to be! The living spaces at La Lagune are modern and well-appointed, featuring a neutral colour scheme, contemporary furnishings and a mix of western and Asian design elements. Bi-folding doors frame the main living area, and may be pulled back to create indoor-outdoor spaces. Set in an open layout, the indoor lounge extends out to include an open kitchen and 12 seater dining set. Housekeeping services, a daily breakfast service and airport transfers are included with your stay. A baby cot will be provided at request (subject to availability). Amenities available at additional cost include in-villa massages, child minding services, personal chef services, villa pre-stocking, travel activities, additional bedding and early check-ins or late check-outs. 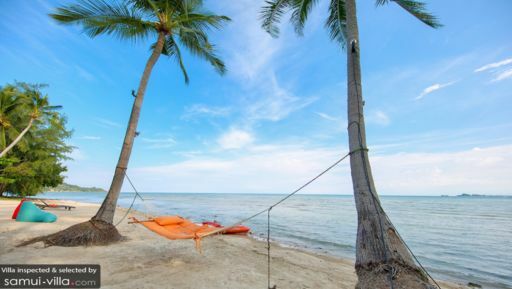 La Lagune is located in Bang Kao, South Samui. Low-key and laid back, the region is largely undeveloped, save for the occasional fishing port, resort or private residence. It’s a place that lends itself well to vacationers seeking a restful holiday, with days spent relaxing by the beach, heading to the spa or a yoga class and enjoying slow-paced dinners by the waterfront. Enjoy direct beach access from your villa. Scenic and remote, the coast is great for leisurely beach strolls, but the sea is unsuitable for swimming. Take a quick drive out to Laem Sor Pagoda, a glittering golden pagoda located along a quiet beach. Khao Chedi, a temple compound located atop the hill is worth a visit for its serene ambience and uninterrupted vistas over Bang Kao Bay and its surrounding villages. Spa treatments and yoga classes are available at the nearby Banburee Resort & Spa (it’s about six minutes’ drive from your villa). Private in-villa sessions may be organised at request - just let your villa manager know in advance! If you’re travelling with kids, take the family out for a fun-filled day ta Laem Sor Disc Golf, or for a trek to Na Muang Waterfall. Bang Kao doesn’t offer much in terms of dining. You’ll have the option of in-villa dining at La Lagune, or taking a drive out to dine out at cafes and restaurants located in the neighbouring vicinities. These venues aren’t too far off, and require just a five to 15-minute drive from your villa. Some of our favourites include Sweet Sisters Cafe, a cosy establishment serving up wholesome, organic fare. There’s also Sabeinglae Restaurant, a popular, fuss-free Thai restaurant, Hemingway’s on the Beach, a relaxed waterfront venue as well as a variety of seafood restaurants located in Thongkrut Fisherman’s Village. This is the second time at the famous La Lagune in southern Ko Samui. It is faultless from a sensual environment, a relaxing atmosphere, culinary cooking and staff hospitality exceptional. We wined and dined so well thanks to the ability of Khun James and her staff. The pool is a great place to chill and the dining table near the pool was a great plus. Indoor/outdoor layout made it very chilled. We had the whole family there from Aus, UK and HK so a great spot to meet and tell stories together. Our son is wheelchair bound and the staff were able to ensure full use of the pool and transfers for him were totally smoothly handled.